Tropical storms, as their name suggest, tend to form in the tropics. However, from time to time similar-looking storms can form at higher latitudes. Extratropical storms have cold rather than warm cores, and they usually form their characteristic spiral shape when air masses of different temperatures and humilities collide. Another type of storm that can take a hurricane shape is a polar low, a small-scale, short-lived low-pressure storm system that forms at high latitudes. On rare occasions, however, there are peculiar, hybrid storms with some of the characteristics of a tropical storm and some characteristics of an extratropical storm. Such storms are sometimes called subtropical storms. 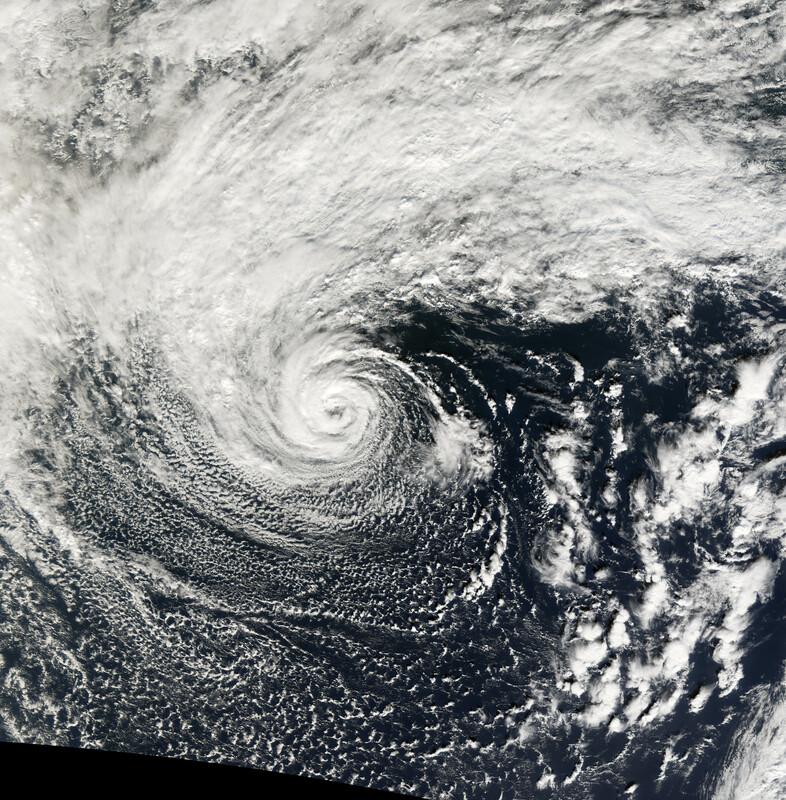 This photo-like image of a rare subtropical storm in the Pacific Ocean was acquired by the Moderate Resolution Imaging Spectroradiometer (MODIS) on the Terra satellite on November 1, 2006. Located 900 miles off the coast of Oregon in the northwestern Pacific, this storm system looks like a hurricane, but it is located far from any of the typical hurricane formation areas. 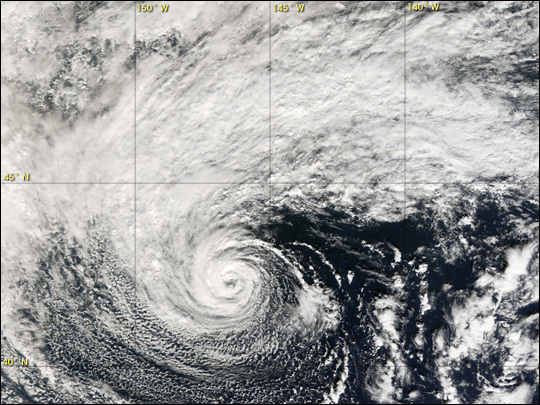 The storm originally formed from a cold-cored extratropical storm, but after spending two days over unusually warm water (perhaps as much as 2 degrees Celsius above normal for the time of year), it developed a warm center, and hurricane characteristics, such as a cloud-free eye and an eyewall of thunderstorms. With satellite-observed winds as high as 50 knots on November 2, the storm was strong enough to have been named if it had been in one of the routinely monitored hurricane basins. Because it formed outside the territory of any monitoring organizations, however, it was not named. The storm was being referred to as “Storm 91C” by the U.S. Navy. You can download a 250-meter-resolution KMZ file of Storm 91C for use with Google Earth. For more on this storm and other unusual hurricane-like storms, visit the blog of Dr. Jeff Masters on the Weather Underground Website. Definition of subtropical cyclone from the American Meteorological Association glossary. NASA image by Jesse Allen, Earth Observatory, using data provided courtesy of the MODIS Rapid Response team at Goddard Space Flight Center.